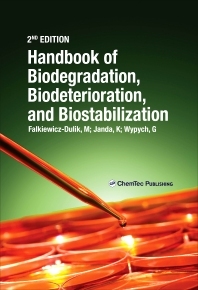 Handbook of Material Biodegradation, Biodeterioration, and Biostabilization, Second Edition gives extensive information on the microorganisms involved in the biodegradation of materials, along with the biocides which are permitted for use according to the most up-to-date worldwide legislation. Mechanisms of biodegradation and biodeterioration, results of biodeterioration, and methods of biostabilization are covered for a large number of products, making the title relevant for a range of industries and applications, including construction, coatings/paints, medical and pharmaceutical applications, and electronics. In addition, the health and safety aspects of biocide application are covered in detail, as well as the personal protection of practitioners who are required to use them. The contents and the most-up-to-date information make this book essential for almost all the fields of applied chemistry. Production chemists and engineers; Environmental engineers; Plastics engineers and polymer scientists.